OLDHAM has two new national champions after Danny Wright and Will Cawley both struck glorious gold at the England Boxing Elite Championship finals at Liverpool’s Echo Arena. Both Wright (20) and Cawley (18) were in blistering form as they battled through three bouts each over the weekend to secure their well-earned titles. For Wright, securing the Elite crown in the 64kg category was the realisation of a long-held dream. He has now won every prize he has worked towards ever since he first entered a boxing gym at aged nine. He told the Chronicle: “It’s just been a great weekend, one I’ll never forget. “I’ve trained so hard to win this title and I’m unbelievably proud. “It’s the biggest domestic title out there to win in the seniors. Wright’s trainer at Centurions ABC Ben Lancaster – the two have worked together ever since day one 10 years ago – said: “Danny was phenomenal. He’s a true champion. “He beat the toughest opponents in what is widely regarded as the toughest division. “He also won the Mickey May boxer of the tournament award. To win that at a national finals is something he will always cherish, and he deserved it. Wright – who dedicated his Elite title win to his Great Auntie, who died over the weekend – owes plenty to Lancaster and his sponsor, Westbourne Civil Engineering. Next up for Wright is representing England again at the Great Britain Championships, a tri-nation tournament next month. In the quarter-final stage, Wright beat Kirkdale’s Tom McGuinness thanks to a unanimous points verdict from the judges. In the semi-finals, it was closer as Wright won via a split decision verdict against Dalton Smith from the Steel City club. 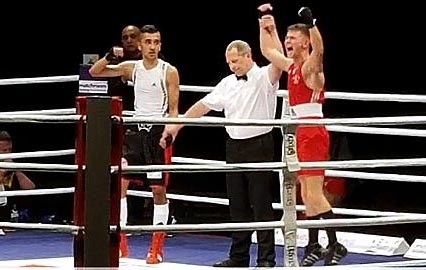 Oldham Boxing prospect Cawley, who has also represented his country at youth international level, triumphed in the 52kg category. He was in magical form throughout, though he did suffer a bad cut in his semi-final unanimous points victory against Muzzy Fuyana from Middlesbrough. Cawley had stopped Army fighter Shamim Khan in the quarters. The final saw Cawley pitted against KBW Club strong-man Ismail Khan, but the Oldham ace out-boxed his opponent and secured a brilliant victory by unanimous decision.